Standard ground shipping in the continental U.S.
Express shipping and international shipping require additional fees. Find great deals on inspirational art by artist Thomas Kinkade by clicking on his individual art titles. Put our art gallery to the test by shopping around and comparing various prices, knowing that our Price Match Guarantee will let you purchase Thomas Kinkade art at the lowest possible prices guaranteed! However, please make sure you bookmark this page before leaving our website. 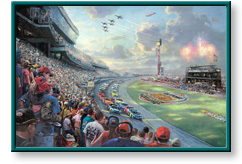 Nascar Thunder and other artwork by artist Thomas Kinkade can be viewed in our artist slideshow. Nascar Thunder - The 50th Running of the Daytona 500 by artist Thomas Kinkade and other Thomas Kincade art, art work, artwork, canvases, giclees, images, limited editions, open editions, paintings, paper, pictures, posters, and prints can all be found at Christ-Centered Art. "The race is off. Fireworks burst on the horizon as countless spectators roar and overhead six Thunderbirds tear through the dancing clouds. In the foreground, 43 mighty race cars thunder by as 'The King' himself, Richard Petty, waves the green flag for the start of The 50th Running of the Daytona 500. As I stand at my trackside easel, painting furiously, the electricity and spectacle of the moment is almost overwhelming. "In my Studio Masterwork release of the 'Great American Race', I have tried to capture the power of the starting moment while paying tribute to the history of this one-of-a-kind Nascar event. On Pit Road, you'll find a parade of vintage race cars that once roared along the track while grandstands overflow with fans of all generations, including a few familiar faces you might discover. The 50th Running of the Daytona 500 was to document this classic event for race fans everywhere." Image Size 18" x 27"
Includes free shipping & insurance. This unframed limited edition paper print comes mint in its original folio, includes a genuine certificate of authenticity from The Thomas Kinkade Company, and is individually numbered and DNA signed by the artist Thomas Kinkade. What is an Artist Proof? This unframed limited edition canvas print comes mint in its original packaging, is stretched on wooden stretcher bars, has a genuine certificate of authenticity from The Thomas Kinkade Company, and is individually numbered, hand highlighted, and DNA signed by the artist Thomas Kinkade. Add $200 to frame this canvas. This unframed limited edition canvas print can be custom framed in your choice of authentic Thomas Kinkade frame. Add $320 to frame this canvas. Image Size 28" x 42"
Add $450 to frame this canvas. What is a Gallery Proof? What is a Publisher Proof? What is a Renaissance Edition? This unframed limited edition canvas print comes mint in its original packaging, is stretched on wooden stretcher bars, has a genuine certificate of authenticity from The Thomas Kinkade Company, and is individually numbered, hand highlighted, and hand signed by the artist Thomas Kinkade. What is a Studio Proof? Image Size 40" x 60"
What is an Atelier National Edition? Add $800 to frame this canvas. 1-877-843-9278 to receive the lowest prices on open and limited edition paper art prints and canvases, including rare sold out editions and new releases. calling outside the United States, please dial our local phone number. Internet - Use the VeriSign secure order form on our website to place an order safely online. Fax - Dial our local fax number to place an order by facsimile. shipping charges. Our mailing address can be found under contact information. We accept all 4 major credit cards: Visa, MasterCard, American Express, and Discover. or MasterCard logo, U.S. money orders, and international money orders drawn from a U.S. bank. The content on this site, including text and graphics, is the property of Christ-Centered Art. All U.S. and international copyright© laws apply and are reserved by Christ-Centered Art. Nascar Thunder by artist Thomas Kinkade as well as other open and limited edition inspirational paper art prints and canvases, giclees, images, lithographs, paintings, pictures, posters, and reproductions by renowned Lightpost Publishing, Media Arts, and The Thomas Kinkade Company artist Thomas Kincade can be viewed and purchased at special sale prices at Christ-Centered Art. Please note: The green frame is used only for decoration and does not come with the image.